On its most basic design an infrared sensor consists of a lens to focus the infrared (IR) energy on to a detector, which converts the energy to an electrical signal that can be displayed in units of temperature after being compensated for ambient temperature variation. This configuration facilitates temperature measurement from a distance without contact with the object to be measured (non-contact temperature measurement). As such, the infrared thermometer is useful for measuring temperature under circumstances where thermocouples or other probe type sensors cannot be used or do not produce accurate data for a variety of reasons. How is emissivity related to IR temperature measurements? Non-contact pyrometers allow users to measure temperature in applications where conventional sensors cannot be employed. Specifically, in cases dealing with moving objects ( i.e., rollers, moving machinery, or a conveyor belt), or where non-contact measurements are required because of contamination or hazardous reasons (such as high voltage), where distances are too great, or where the temperatures to be measured are too high for thermocouples or other contact sensors. What should I consider about my application when selecting an IR thermometer? The field of view is the angle of vision at which the instrument operates, and is determined by the optics of the sensor. To obtain an accurate temperature reading, the target being measured should completely fill the field of view of the instrument. Since the infrared device determines the average temperature of all surfaces within the field of view, if the background temperature is different from the object temperature, a measurement error can occur. OMEGA offers a unique solution to this problem. Many OMEGA infrared pyrometers feature patented laser switchable from circle to dot. In the circle mode a built-in laser sighting creates a 12-point circle which clearly indicates the target area being measured. In the dot mode a single laser dot marks the center of the measurement area. A handheld infrared thermometer is one of the most popular type of infrared pyrometer. They are commonly used for portable applications although some models also feature an integral tripod mount. 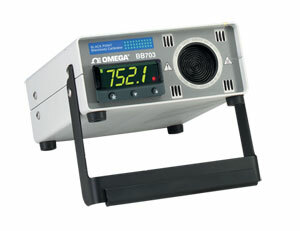 OMEGA offers a large variety of infrared thermometers in various shapes and form factors. Many of OMEGA pyrometers feature OMEGA's patented Circle Dot/Circle Laser thermometer which clearly outlines the field of view of the gun. How is a infrared pyrometer calibrated? There are basically two types of infrared calibration sources, hot plate blackbody source and cavity type blackbody source. The hot plate style consists of a metal plate (usually aluminium) with or without concentric grooves where the temperature of the-plate is set and controlled using either an inexpensive potentiometer dial or a high-end temperature controller. The temperature of the plate is sensed using either a thermocouple or an RTD probe. The hot plate is usually painted dull black to improve the surface emissivity. The surface emissivity of a hot plate calibration source is typically 0.95. OMEGA's BB703 Model is a high-end hot plate blackbody source with a built-in temperature controller. The calibration source with built-in temperature controller has much better accuracy and stability compared to a potentiometer dial type unit. The cavity type blackbody source consists of a blind hole in a cylinder or a sphere where the temperature of the cavity is controlled by a temperature controller, using a thermocouple probe. The cavity type blackbody source has a higher surface emissivity than a hot plate blackbody unit. The emissivity of a cavity type blackbody source is typically 0.98 or higher. The OMEGA's BB705 Model cavity type blackbody typically goes to higher temperatures (over 530°C [1000°F]) than hot plate blackbodies. In addition, having a higher emissivity value makes them ideal for precise calibration tasks. Type of blackbody (hot plate or cavity type) tells us about the construction and overall performance of the unit. Target area tells us how large of an area we can check our infrared thermometers with. The target area should be larger than the field of view of the thermometer; otherwise the infrared thermometer will be measuring the target area plus some of the surrounding cooler areas. 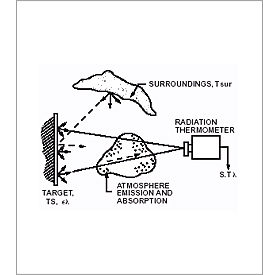 Normally, an infrared thermometer is checked against a blackbody source at a relatively close distance (about 0.15 to 1m), depending on the target area). The higher the target emissivity, the more ideal is the calibration. At lower emissivity targets, wavelength bandwidth of the infrared thermometer comes into play. Ideally at E=1.00, wavelength bandwidth of the DUT (Device Under Test) is not a factor.